The winter season has its beautiful snowfalls, though it can take a toll on the roof of your building or home. B & W Roofing offers roof shoveling to our customers to free them of this potentially dangerous home maintenance task. We have the right equipment and know-how to carefully shovel roof snow and remove ice dams that may form from the continual melting and re-freezing of snow. Is there ice in your gutter? Call B & W Roofing! Clearing snow and removing ice build-up from roofs are done quickly and safely by B & W Roofing. 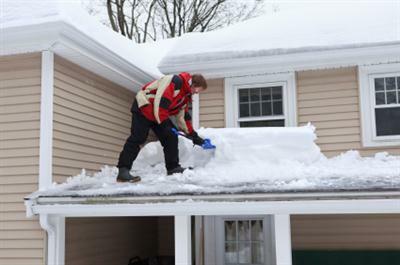 We will remove the snow on your roof and ice in your gutters before leaks and damage escalate. We’ll save your roof and home from that heavy load. B & W Roofing always does a thorough job. As we perform your roof snow removal, we will inspect your roof for snow and ice damage and make any necessary repairs. B & W Roofing uses high quality roof rakes and snow cutters to remove the snow off your roof, which will help prevent ice dams and leave your property in a safe condition. Our trained roofers use the proper precautions not to damage your roof materials or structure. Let us be the ones to climb that slippery slope! Contact B & W Roofing for professional roof shoveling. Don’t wait till it’s too late. You don’t want snow and ice to damage the exterior or interior of your property!